SENLUO Solar Fountain,Solar Powered Bird Bath Fountain Pump 1.4W Solar Panel Kit Water Pump,Outdoor Watering Submersible Pump for Fish Tank,Garden,Pool,Pond,Aquarium | Fountain City Art Ctr. Solar Powered Fountain Pump,SENLUO Solar Fountain Pump Brushless Bird Bath Fountain Solar Power Water Floating Pump Kit with Different Spray Heads for Pond Pool Garden Decoration. Promote the oxygen cycle, increasing the flexibility of the pond, so that fountains, flowers, grass, fish, the natural environment blend together,make your garden more attractive. 4. Small cute fountain very suitable for bird bath, outdoor pool pond and garden decoration. 5. Pump must be completely immersed in water, Dehydration will wear the parts of pump, then shorten the product lifespan. 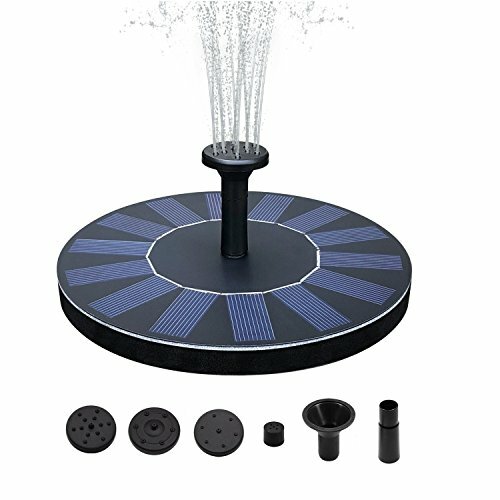 Max water flow height: 18" / Regular:10~15"
Min water depth in fountain: 1 3/4"
Solar Power Fountain Pump: runs automatically by solar, no battery or electricity needed,convenient to use. It's good for the environment using renewable source of energy. 6 Nozzle Sprayer Heads Design: different sprayer heads for different water style, assemble different spray heads for different height and shape of the water flow to get the purpose you want The water can rise up to 12-30 in approx. Multi-Application: This eco friendly solar pump is perfect for bird bath, fish tank, small pond, pool, garden, water circulation for oxygen. Let your yard look so amusingly decorated by the solar water pump. Floating Fountain Pump: It is very easy to use. You just have to do is, make the pump float on the water. Once the solar panel gain sunlight, it will run automatically within a couple of seconds. The brighter it receives the sunlight, better it works. What You Get: 1 Solar Fountain Pump, 6 Attachments, 1 Big Suction Cup, 1 Long Fishing Line, User Manual, 12 Months Warranty Card and Friendly Customer Service. If you have any questions about this product by SENLUO, contact us by completing and submitting the form below. If you are looking for a specif part number, please include it with your message. Solar Fountain Pump, Poweradd 10W Solar Powered Bird Bath Fountain Pump with 13 Nozzle Accessories 16.4ft Pump Cord Oxygen Aeration Water Fountain Pump for Garden, Yard, Pool.